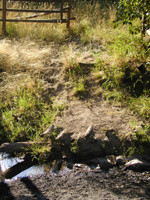 The restoration site is located on Paradise Creek north of Moscow, Idaho on rural private property managed for horse pasture. The riparian area on this property is vegetated with quaking aspen, Douglas hawthorn, snowberry, serviceberry, cow parsnip and many other species composing a healthy riparian buffer of native species. There was a specific area where horses were allowed to cross the stream, causing disturbance to the streambanks and stream channel substrates. 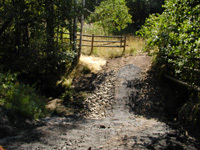 PCEI worked with the landowners and contractors to install a hardened rock stream crossing. A shallow excavation was performed and rock fill, eight inches or less in diameter, was placed in the depression. A strip of gravel was placed on the larger diameter rock. Filter fabric was installed beneath the rock. Disturbed areas without rock were grass seeded and covered with erosion control fabric. The site now serves as a source for transplants for PCEI’s ongoing watershed restoration projects. Student groups help PCEI transplant aspen, snowberry, and rose and collect seeds for propagation. This donation from the Gartons amounts to a considerable cost savings for PCEI. This project site was in relatively good condition, the section of Paradise Creek flowing through the site has populations of Quaking Aspen, Douglas Hawthorn, Snowberry, Serviceberry, Cow Parsnip, and many other species that compose a healthy riparian buffer. Our restoration effort targeted a specific problem area that sustained disturbance from an established horse crossing providing access to pasture on both sides of the creek. Prior to restoration, continuous use of the stream section as an animal passage contributed to non-point source pollution and erosion. The presence of large stands of Canada thistle in proximity to the creek was also of concern. Before work began, sediment was introduced into the stream often as horses crossed the creek in this location.